Is your first reaction, with maybe, just a tiny pun intended: “What on earth is all this about?” Mine was. Granted, I was past the eye rolling and the “hmmm…..whatever….” stage of life’s proceedings, but I was a newly qualified Pilates Instructor and I didn’t get it, understand it, or more importantly, feel it. I do now though, and I’d like to try and explain the significance of Ground Reaction Force (GRF) and how an awareness of GRF can enhance movement – all movement: walking, running, sitting and yes, Pilates exercises. In Physics and in particular biomechanics, the ground reaction force (GRF) is the force exerted by the ground on a body in contact with it. For example, a person standing motionless on the ground exerts a contact force on it (equal to the person’s weight) and at the same time an equal and opposite ground reaction force is exerted by the ground on the person. Newton delivered this to the world in his masterwork, Philosphiae Naturalis Principa Mathematica, commonly known as Principa, published in 1687. Would you like to see that the Law in it’s original Latin? When you walk, you push your foot into the ground and there is an equal reaction from the ground. The ground doesn’t give way underneath you, (well, not often anyway). Instead it provides a basis to send you (or, put another way, move you) forwards instead. Or up, if you are squatting. When walking you aren’t pulled forwards from the front. It isn’t possible. You are, in a manner of speaking, pushed from behind. The leg, and specifically, the back of the leg reaches back into the floor and your body moves forwards. The GRF provides an upward force to help our muscles generate power to keep us upright in standing and in sitting or squatting. Well, to a certain extent it doesn’t matter. We’ve lasted this long without clarity on the issue, but understanding where movement comes from can enhance movement quality and contribute to strength and stamina gains by increasing efficiency and economy – getting more movement from less work. For me it matters for another reason. Pilates is preoccupied, obsessed even, with the core. It is as if the core is some mystical inner force that generates, creates, upholds and magically enhances movement. Be that as it may, you aren’t going to get far with out the ground and the GRF. The Core shouldn’t be the defining concept of Pilates or any exercise. Granted, it’s right in the mix but there is so much more happening. We talk a lot about growing taller or/and a sense of length in the body in standing. Fundamentally this happens from the ground up – feel the feet spread out and meet the floor and use that to generate length. In standing this can be enhanced by a sense of the inner thighs lengthening up to the pubic bones and this sensation carrying on up through the spine with the crown of the head finally reaching up to the sky. This same sense of meeting the ground with the feet can be used to think through and feel whether or not you might be favouring one leg over the other or whether you are tending to favour standing into the balls as opposed to the heels of the feet. Ideally the feet meet the floor with the spread of weight equal right to left and front to back. Abdominal curl – encourage two way length through the back of the body by sending the feet gently into the floor as the back rib cage lifts the opposite way, up and off the floor. This length is important for the exercise and indeed is the exercise, complimented by the reciprocal contraction of the abs at the front of the body. 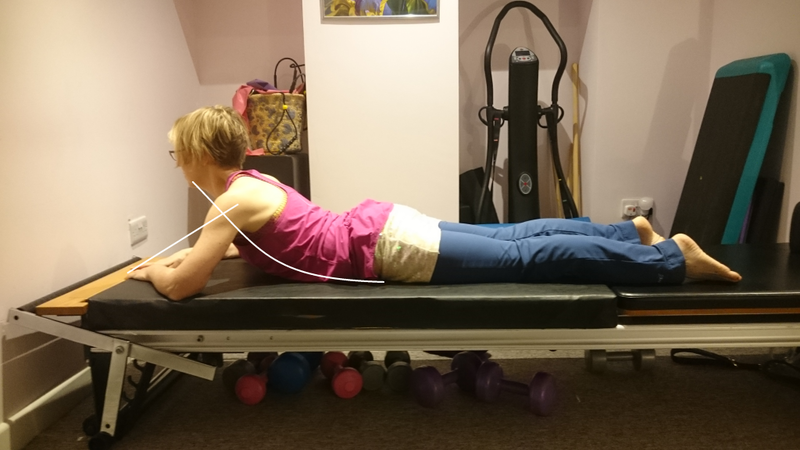 Spine Extension/Diamond Press – press gently down into the floor with the bent arms (Diamond Press) or hands (full extension) to generate lift and articulation through the spine without overtly making the back muscles work as you would a back raise exercise. Squat – the emphasis of the exercise is on the up phase – send your feet down into the floor to generate uplift to standing. In this position, conscious use of the GRF is really fundamental. All four exercises such as Plank and the Box Press Up sometimes go awry because to upper body is not stabilised correctly. When in position, ensure that your wrists, arms and shoulders are stacked. It is harder to assess but try to ensure that your thigh bones are directly under your pelvis. Be aware of sending the heels of the hand down into the ground. This generates lift through the back of the arms and across the shoulder blades. Without it, the shoulders slump and the body weight is transferred into the elbows and wrists. Good movement is impossible and the wrists hurt because they are overworked -supporting body weight when they shouldn’t be. This is a win win position. You are using the triceps of the back of the arm correctly to help maintain the position, thus using/developing/strengthening the muscles before you even embark upon an exercise and who, dear reader, doesn’t want to work the Triceps? There is no direct contact with the feet, however, in order to lift the arm (for example in a front raise or side arm raise) you have to upwardly rotate the shoulder blade. 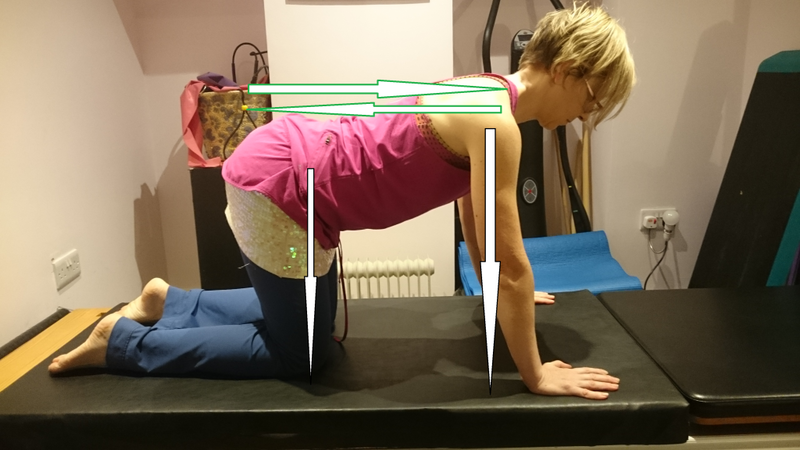 This happens via the action of a number of shoulder muscles which are attached to a big stable structure, namely the trunk, which gains stability, at least in part, via connective tissue in the small of the back which attaches to the big muscles of the legs and ultimately the floor. So the GRF indirectly influences upper body movement. Be aware of this sense of the body being “sent” forwards from behind. To walk efficiently and after all, that is a necessity if you are to walk significant distances, as humans are designed to go, you need length as well. Walk as if you are wearing the crown jewels. 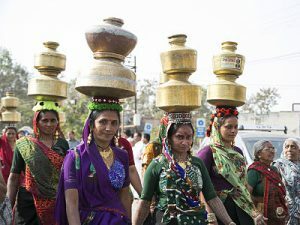 If you want a more Republican metaphor, walk as if you are carrying a water pot on your head. The women in this picture embody what it is to harness GRF, and achieve length in the body and efficiency of movement. An awareness of the GRF can help runners because it can contribute to efficiency of movement which is vital. You want to cover the maximum distance with the minimum of effort. Energy usage and muscular work should “be as much as necessary and as little as possible.” Be on your guard to avoid becoming a “pavement pounder” – hitting the ground with force, thereby sending energy into the pavement rather than harnessing the opposite force. Feel for the presence of thudding. It’s easier to spot if you have head phones on. If you think you might be thudding, could you substitute that for a lighter touch? With correct gait you do indeed land with a heel strike but this is the soft, shock absorbing stage of the gait cycle. In simple terms, next you move through the mid foot and push off with the strong, stable forefoot which is reaching in and away from the ground. The body needs to be tall and stacked with a sense of lift, a sense of “up”. The eyes should be forwards because the head is sitting on top of the spine. Clearly there many other factors involved in good running – having flat feet or other feet issues, recovery from injury, postural stuff, tight muscles. I’m not going to mention them here, but I don’t want you to think that awareness of GRF is the sole determinant of good running style. Yes GRF is still a thing, even in sitting! 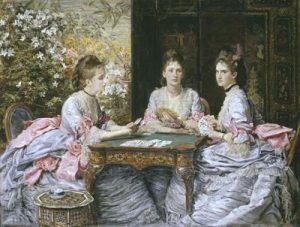 To sit like these Victorian Ladies, painted by John Everett Millais in 1872, (minus the corset), continue to meet the floor with your feet. The stability in your legs should be generated from uplift from the GRF and not by tensing the front of the thighs or crossing the legs and gripping through the inner thigh. Importantly, use what I like to call “Chair Reaction Force” – the sit bones reach into the chair to generate lift. Think of your sit bones as your Sit Legs. The action of the Sit Legs and your Feet will help to keep the spine long and not slumped down which is bad for your muscles, bad for your back, bad for your breathing and digestion because of the compression of the internal organs. If running is your thing, why not read this article about improving your running.